So, on Monday I conducted an informal poll about when to post the Holiday Contest guidelines, and people were pretty evenly divided as to "Monday is fine" and "As soon as possible" :) I'm splitting the difference and thinking I'll post on Friday, before the weekend, so you get a few extra days. But I'm still trying to make a definite decision as to what to make you do - ah! the power! :) - so not today. I hope that doesn't ruin anyone's life! It's barely a week until Thanksgiving. So I was thinking we should get festive with our Something Chocolate... Check this out! 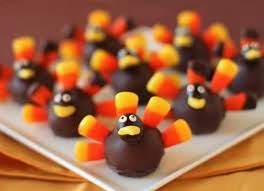 Have you ever seen cuter chocolate turkeys? Now that we're choclified (fortified with chocolate), let's get down to the business at hand. Today's pitch comes to us from Mary Russo, PhD, a psychologist and RNCS, who for over 2 decades has worked with individuals to deal with personal development and overcome anxiety and depression. Mary says, "Through many therapeutic endeavors I assist them with their adaptation to a new sense of self. In my therapy work I share a deep concern for the individual's conscious awareness that each of us has our own yearning inner child. I have been inspired to write this and other children's books to help children to be less afraid and see themselves as strong and unique. My goal to teach children to help themselves through their imagination. The stories provide metaphors to help children learn to take control of their fears, by fostering self-empowerment. The embedded messages slip into the child's unconscious, while the story produces a sense of fun and adventure and wonderment." The Pitch: Polka Dot Sue is the story of a young girl with polka dot hair, who takes great pride in who she is and conveys this pride with her enjoyment of clothing herself handsomely each day. The story gives a child the sense of self acceptance and pride to show others that a deep sense of self-empowerment come from believing in one self despite obstacles. With the color-emotion awareness, another sense of expressiveness, it encourages the young reader to understand more about feelings with color and self-expression. Also with the encasement the days of the week the story gives the young reader an opportunity of for more fundamental growth. I would read it! It sounds like a sweet book for a very young child, I'd say, age 2-4 more than 3-6. Yes. Mary I think you nailed the idea of messages in your bio - "embedded messages slip into the child's unconscious, while the story produces a sense of fun and adventure and wonderment"
So, maybe try the classic "hook, book, cook" query paragraph format. Your first sentence fits in "hook" but the others may be more "book." We need the hook filled out with what's happening to sue, with the fun and adventure, which will let the message slip into the editor's subconscious too! Yes, I would read it. I agree with Mary that perhaps you could tighten up the pitch a bit. I commend the premise of this book, and feel there is a definite need for such a book and LOVE the idea of polka dot hair! I'm a Maybe only because the pitch doesn't tell me much about Polka Dot Sue herself. Am curious what obstacles she'll encounter and how she'll overcome them. Maybe. While the story sounds fun and lively, the pitch is a bit too formal in tone. I'm a "maybe" also. To me, the pitch gives a better sense of your platform (what makes you able to write this book) than the plot. Aside from knowing about Sue's polka dot hair and that it involves her getting dressed, I don't know anything else that happens in the story. I think it is wonderful that you wrote a book to help kids in this way. Now you just have to write a pitch that really sells it! Good luck! It sounds like a nice idea and a positive message is always great, but I would avoid explaining the message in the pitch. An editor once told me that we should "enchant children, not teach." Certainly a message can (and even should) be there, but it needs to be understated- and definitely in the pitch. I wrote a book which has what I consider an understated message of sharing but which one (mean) reviewer called "preachy didacticism" (which is somewhat redundant and over-exxagerated and makes me wonder about her credibility…aargh :-)) In any case, I would be wary of showcasing the message. Editors want to hear about the story. Story is everything! The Pitch: Mary, I like your title and feel I would pick the book up based on that. But...I want to see more playfulness in your pitch. Your pitch is (to me) is not embedding your message but comes across as telling instead of showing. The language is very adult. I think the language in your pitch should be a small taste of what the reader will see in the text of your story. As I read your pitch, I feel you're trying to appeal more to the parent than the child. I know the parent will be the one reading the pitch, but they're looking for something to read to their child. I believe if you could give us more of a glimpse of Sue and bring out the her childlike personality by simplifying your language, it would be more of what I would want to see on the dust jacket of a picture book. I want to feel the sense of wonderment, adventure, and imagination that you talk about in your paragraph above your pitch. Think about pitching your story to the young child who will be listening and I believe you can bring out the fun in your story. So even though I'm sold on the title, I'm only a MAYBE on the book. If you tighten this pitch with more about Polka Dot Sue (cute!!!) I will definitely be a YES! Those chocolate turkeys look better than the real thing! As for the pitch, I'm a maybe. The title and intro of the pitch sound fun, but then I found myself skimming. What does Polka Dot Sue do in the story? What obstacles does she encounter? How does she overcome them? Is the mood serious or funny? I'd try to get that voice in your pitch. All the fabulous things a kid can get from this book should be in your cover letter/query. I think your pitch should be about what happens in the story. Good luck with it! It sounds like a fabulous premise for a book. Polka Dot Sue is the story of a young girl with polka dot hair who takes great pride in who she is. Every day of the week, Polka Dot Sue dons bright outfits that match her feelings and show the world who she really is. I would read a story about a girl with polka dot hair, but your pitch doesn't tell me what the story will be. Study pitches online. Your pitch has to set the tone for your book. Is it fun or serious? A pitch tells a tiny story, about 50 words or less. I love that you layered in the days of the week. I think Sue will have an interesting personality, but show don't tell about her. What does she do that makes her this way? What is the hook that is going to make us wonder what happens? That makes us want to see the rest of your manuscript? If you can embed the message in the story, than you can embed a message in the pitch. The last two sentences are things the editor should pick-up from your pitch without you having to tell her. Hmmm, I'd read it but, as a newbie, it's been drilled that agents and editors hate preachy, lesson-filled stories. Yet I'd bet Dr. Russo's expertise has led her to write a good story. Perhaps, leave out the message wording and write the pitch to reflect the character and the obstacles she overcomes. Thanks, Susanna! I'm looking forward to the contest. And the chocolate treats are adorable! And yes, I'd read it. I like the concept of the story. My suggestion would be to write the pitch more from Polka Dot Sue's perspective so it sounds fun to kids. Something like, Sue was proud of her polka dot hair. (Just a rough idea.) And then maybe continue on how she enjoys choosing her clothes to match it, etc. Perhaps it could be summed up by mentioning the benefits to the child reader, editing it to one or two sentences. I think it's an intriguing story idea! Really cute and has a great message. I hope this is helpful. Thanks for sharing, Mary! Good points, Beth. Thank you for sharing. I'm sure Mary will find your thoughts helpful! Thanks so much for taking the time to craft a starting point for Mary, Wendy. I know she'll find it very helpful! Hahaha! "You laugh at cliches" reminds me of some movie character somewhere saying something along the lines of "I laugh in the face of danger!" :) Thanks so much for your very thoughtful comments for Mary, Penny. You explained everything so nicely and I know she will find it helpful! You may have as many chocolate turkeys as you like, Pam. They have no calories and I have an unlimited supply :) Thanks so much for your excellent suggestions for Mary - very helpful! Thank you so much for your thoughtful comments and thought-provoking questions, Joanne. I'm sure Mary will find them helpful! Excellent suggestions, Cheryl. Thanks so much! I'm looking forward to the contest too! SUCH great prizes!!! I really like the story idea, but there is too much info given in the "message." I want to hear more about the story nd if there is any conflict or problem that challenges her a bit. I would keep the benefits to the reader to a minimum and focus more on the story. Thanks for the treat idea! I would read this, but the pitch could use help if you want readers that are not specifically looking specifically for a confidence-booster. I like Cheryl's suggestion to write the pitch from the mc's POV. But I would include the other info in a query/cover letter. Thanks for the treat idea! I would read this, but the pitch could use help if you want readers that are not specifically looking for a confidence-booster. I like Cheryl's suggestion to write the pitch from the mc's POV. But I would include the other info in a query/cover letter. Looking at those treats is making me hungry... it must be lunchtime! :) Thanks so much for chiming in with your thoughts for Mary, Julie! Mmm...pretty chocolate! Plus I can always use a reason to buy candy corn. "Polka Dot Sue wears every color in the rainbow, from her purple-tipped shoes to her polka-dot hair." All the adult reasons for reading--like color-emotion awareness--would be great in a short bio paragraph, though. You could discuss your background, and how that informs the book. Mary, I like the story idea, but think the pitch is too formal. I've read through the earlier comments and really like Penny, Cheryl and Iza's suggestions. Books with a message or theme can be fun, so I'd play up the fun! Polka Dot Hair must be fun. Good luck! Susanna, I love the turkey truffles. I'm about to make chocolate truffles right now (much easier recipe I think!). And, one of your comments about the contest made me stop reading and move to my PiBoIdMo file! Then, I returned to comment. Thanks for all you do. The title is very cute and will get some attention. As many others have said, the formality of the pitch doesn't say "picture book." I'm not sure what the story problem is, so that needs to be stated. I like the idea stated by others to make the pitch in the MC's voice, tone down the psychologist's language, and have more fun with it. Good luck, Mary. Pitches are really hard work. Thanks so much for chiming in and encouraging Mary, Rosi! Maybe to help with getting more story out, try and write down what is different about this empowerment story compared to say David Shannon's Stripes which is fabulous! There is always room for an empowerment story, just don't write it in the pitch. Sounds cute! I would definitely read Mary's story, because I think it sounds perfect for little kids. However, there are a few things I want to bring up (and I'm rushing out of the hotel so I can't read all the other comments right now, so please forgive me if I repeat what others say). For one, it sounds more like a pitch to a business meeting rather than a pitch to hook an agent/editor/reader's interest. Also, as it reads now, the story sounds disjointed - one random lesson after another rather than a coherent story. Sorry to sound harsh; I really do think the story is actually good but the pitch needs work. Good luck, Mary! Yes, I'd read the book, but I think the pitch is bogged down with details. The pitch gives 1 sentence about the plot and 3 about the message and the other details. I like the idea of the story a lot!